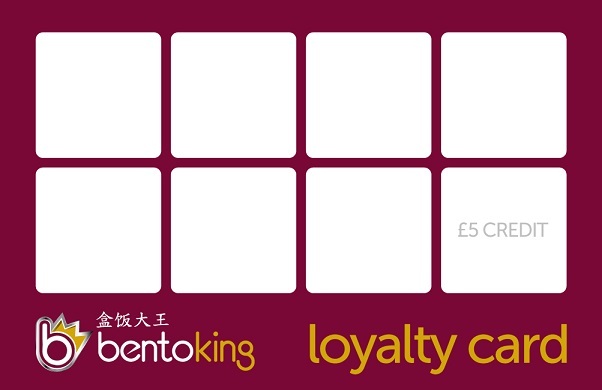 In order to thanks all our regular customers, Bento King would like to present you our loyalty scheme. You will receive one sticker (which will be attached to your receipt stapled to your food bag) when you order over 15 pounds (excluding delivery charges), then you can take out the sticker to put it onto your loyalty card. 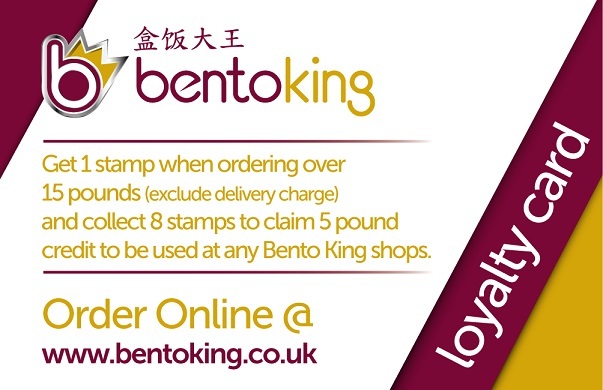 Once you have collected 8 stickers on your loyalty card, you will receive 5 pounds credit which can be used at any Bento King stores. If you haven’t got one of our loyalty card, just simply ask for one next time when you order from us. Please note, only orders made by phone or on our own online order website (www.bentoking.co.uk) will receive stickers. Any orders placed with a third party agent website will not receive any stickers.